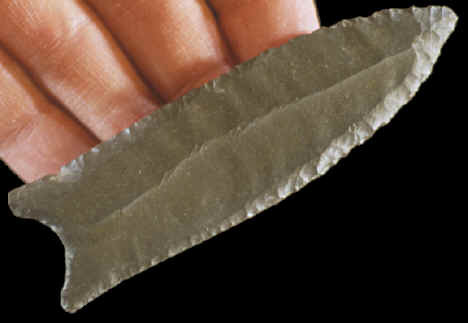 This fluted point is reported to have been found in Tennessee. Other than that, very little is known about its history. 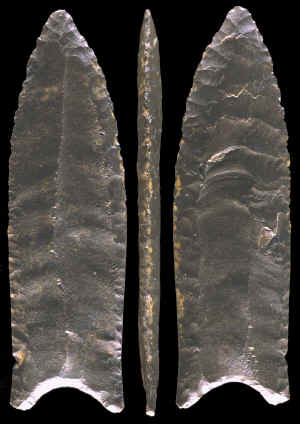 It is a style of fluted point that occurs in states east of the Mississippi River and can be found in the same states that Cumberland and Barnes points are found. This style of fluted point is much thinner than the more heavy duty Cumberland and Barnes points and in this respect they are closer to Folsom and Crowfield points. One side of this point is double fluted to the tip. The other side is also double fluted but only half and three quarters of its length. This point reflects a Paleo craftsmen's knowledge and skill of fluting that is difficult to replicate today. This picture shows three views of a "long fluted" eastern style fluted point. It was fluted several times in a way that reflects the skill of the craftsman who made it more than 10,000 years ago. This point measures 3 7/8 inches (9.8cm) long, 1 1/8 inches (2.8cm) wide and 1/4 inch (6mm) thick. Personal communications with Dennis Stanford.